Santa Claus Conquers The Martians. Santa Claus. And now: The Christmas That Almost Wasn't. 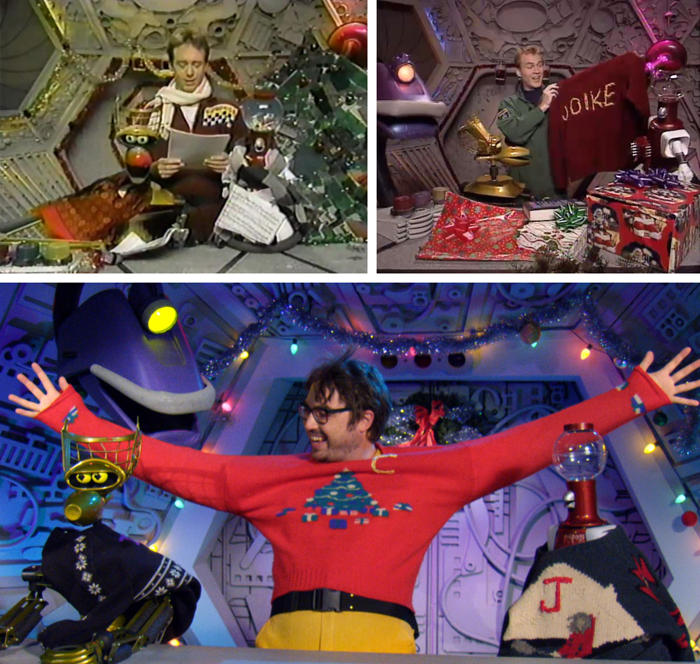 Three holiday classics spanning all three eras of MST3K. Two of them have already become seasonal staples for many MSTies. December just wouldn't be the same without a rousing rendition of "Have a Patrick Swayze Christmas" or a JOIKE sweater gift exchange. But Season 11 brought a solid new holiday episode into the repertoire that's chock-full of Christmas spirit (and in HD to boot). Will The Christmas That Almost Wasn't make it into your regular end-of-year rotation? Can it match the nostalgia factor of the first two? What's your favorite Christmas MST3K episode? Sound off in the comments or on social media! When I was growing up, the local TV station showed terrible movies right after school. My grandparents were control freaks who always had the TV on – I wasn’t allowed to go to MY OWN ROOM to do my homework, I had to do it in the same room as them WITH THE TV ALWAYS ON. MST3K I always felt was both a way to redeem that traumatic childhood, and a sort of revenge on my terrible, terrible grandparents. Many of the movies MST3K have riffed I first viewed on ‘The Big Show’ oh so long ago. Every Christmas this station showed ‘Santa Claus Conquers the Martians’, so it has a particular poignancy for me. Plus, you really cannot beat ‘A Patrick Swayze Christmas.’ You just can’t. Either way, it’s a great one. “Santa Claus” might be my favorite, but it’s not Christmas if I don’t pop in as many riffed Christmas movies as possible. And there are a LOT to choose from. Santa has encountered Martians (three times, thanks to MST3K, Cinematic Titanic, and Rifftrax), Satan (twice! ), Bela Lugosi-esque bitter landlords, Ice Cream Bunnies, and everything in between, and Christmas just isn’t Christmas without some cinematic cheese to inspire some Yuletide cheer! A convenient excuse to watch more MST and Co.? Possibly. But hey, a tradition is a tradition!